Rum and cigars go remarkably well together, sharing complementary flavor profiles and a similarly tropical heritage. This is no secret to anyone remotely familiar with cigars or spirits. So what new light, if any, can be shed on cigar and rum pairings? Plenty. In fact, I would argue that simply matching a random stogie to a random glass of liquor is doing a grave disservice to both. Care and attention must be paid to selecting a rum that accentuates a cigar’s flavors without overwhelming them. Perhaps the right rum adds spice where there is little, or adds a touch of sweetness where there is spice (see El Dorado). Either way, you don’t want the match to be too on-the-nose. The perfect rum for a given cigar will both round out existing flavors and, within reason, hint at new flavors that could not be uncovered without the drink. Like the combination of beans and rice, the marriage of cigar and rum conjures flavors and textures neither product could produce on its own. 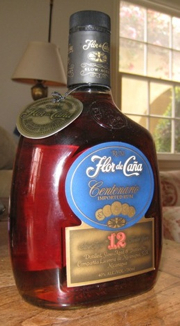 Flor de Caña is one of my favorites: a premium Nicaraguan rum sold at upscale supermarkets, served at cigar bars, and probably available online from specialty retailers. In particular, Centenario is well worth the $25-30 or so that you’ll pay for a 750ml bottle. This is a 12-year-old sipping rum, to be enjoyed straight or on the rocks – but never muddied with a mixer. The Centenario has the medium caramel coloring and peaty aroma of a single-malt Scotch – quite unusual for a rum of any variety. Like a good Scotch, it too must be given some time to “open up” or air out after the first pour. It can be quite strong when fresh out of the bottle, and I find that a few minutes of airing, and perhaps a dash of cold water, will help unlock the complexities of the liquor and mellow out its bite. Once sufficiently “opened,” the rum still maintains its peaty strength, but will reveal hints of citrus, hazelnut, vanilla, and spice. This is not a sweet rum by any means, and as such I would not recommend pairing it with a light-bodied or overly mellow cigar. At the same time, the flavors of the rum might be cancelled out by a strong or spicy stogie. I would recommend pairing the Centenario with anything from the Fuente Hemingway line, perhaps a Rocky Patel ’92, or especially an Oliva Serie O – the latter being a Nicaraguan puro to match this Nicaraguan rum in character and in flavor. This is one of my favorite rums, and I agree with your assessment. Thank you for the cigar pairing suggestions — always fun to try new combos! Thanks for posting this. I enjoy the Flor de Cana too. Absolutely correct as this isn't a "sweet" rum (such as a Zaya); yet it is still delicious. A fuller-bodied cigar is the right pairing. As always; you guys hit the nail on the head with your recommendations. Thanks! 🙂 I've been a big fan of Flor de Cana ever since I was turned on to it by the owner/bartender of a really cool cigar bar here in LA. It definitely upturned all existing notions I'd had about what a rum could be. I'd been used to the mass-market stuff, most of which tends to run sweet for American palates. This is a completely different animal. Well worth it if you can find it. A minor update: I've also been told by a friend, originally from Nicaragua, that the family who owns and distributes Flor de Cana is considered something of a pillar of the local community. Supporting this family supports some good people in a region torn by strife and conflict over the last few decades. I haven't tried this rum yet, but I really enjoy a nice tumbler of Zaya on the rocks in the summertime. Will have to give this a shot (pun intended).